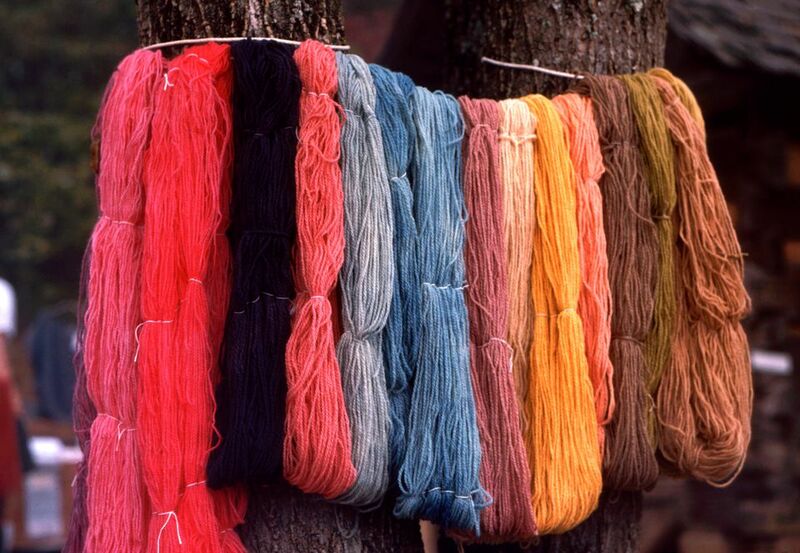 For thousands of years, dyes were created by using natural materials like leaves, roots, bark, and flowers. Some of the most beautiful and longest lasting colored fabrics were created with those natural dyes. Today, most fabrics and fibers are dyed with synthetic dyes that create reliable and easy to repeat results. The liquid synthetic dyes you can buy for home use involve fewer steps than naturally created dyes. Part of the joy of creating your own dye are the happy mistakes and surprises that can come by combining plant material and mordants. A mordant is a substance used to permanently bond dyes on fabrics or create a chemical reaction to create new colors. Mordants include alum, sodium chloride (table salt) and certain metal salts like iron, copper, and tin. Whether you are planning to dye fabric or yarn, you must prepare the item by removing any commercial finishes and treating the fabric with a new mordant. All washable fabrics should be washed to remove any finishes applied during weaving. Before washing, weigh your fabric or yarn. The best results come from dyeing in smaller batches usually around one pound. The amount of mordant used in each batch should be measured carefully. For alum, divide the weight of the material to be dyed by four to get the number of ounces of alum to use. Two level tablespoons equal one ounce of alum. Add the alum in the dyeing pot and fill the pot with warm water leaving room for the textiles. Stir until fully dissolved. For iron, copper, and tin mordants, use 1/2 ounce (two teaspoons) per pound of fiber. When ready to dye, completely wet the fabric or yarn with warm water. Squeeze gently to extract excess water. Add the fabric or yarn to the water and mordant solution stirring gently. Be sure the fabric is open and every surface is exposed to the water. Heat the pot to 180 to 200 F and keep it at that temperature for about one hour. Stir gently occasionally. Let cool overnight with the fabric in the water. Your fabric is now ready to dye. Begin by cutting large plant material into 1-inch pieces. For flowers and fresh leaves and stems, begin with about one quart of plant material to your large pot and add enough water to cover it by an inch or so. Boil for twenty minutes to extract the dye. Strain to create the dye bath. For roots and bark, you will get better color if you soak the plant material overnight and then boil for thirty minutes. Strain, saving the colored water, adn then cover bark with water and boil again. You can do this several times to extract more dye. The best pots for extracting dye are stainless steel or unchipped enamel. Aluminum pots can be used but they can be permanently stained by dark dyes. Iron pots will cause colors to darken. If you plan to dye frequently, you may wish to have a dedicated dye pot as some mordants and plants can be toxic. Remove the fabric from the mordant bath. Dispose of the mordant solution. In a large pot, add the extracted dye solution. Add enough water to the dye solution so the fabric or yarn can move freely in the dye bath. Add the fabric and heat to 180 to 200 F. Heat for one hour or until the color. Remember the color will be darker while wet and will lighten when rinsed and dried. If the color is too light, use more dye extract in the bath. Allow the fabric to cool enough to handle and rinse. Fabric should be gently squeezed through several changes of water until the water runs clear. The fabric can also be rinsed in the washer by running a cycle with no detergent. Yarn should be rinsed in an up and down motion to help remove tangles and smooth it. There are several plant dyes that can be modified by using an iron mordant to significantly change the color. Iron will turn some golds to moss greens, reds to plum or maroon, and will darken browns. The modification takes place after the fabric is dyed with the original plant dye bath. Fill a dye pot or bucket with warm water, add one tablespoon of ferrous sulfate per pound of fabric or yarn. Stir to dissolve completely and add the fabric and allow ​to soak until the desired color is achieved. Then, rinse and allow fabric to dry. Is This Shirt Colorfast and Does It Matter? Do I Need to Wash New Clothes Before I Wear Them? Do I Need Washing Soda? Are You Hand Washing Clothes Correctly? What Is Laundry Bluing and How Do I Use It?